iSeries Navigator for IBM i5/OS and OS/400 is the graphical interface to manage your IBM eServer iSeries runtime environment. V5R3 iSeries Navigator contains major functions and interface enhancements over previous releases. 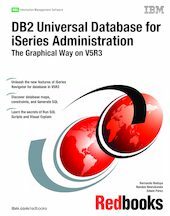 This IBM Redbooks publication presents an overview of all V5R3 iSeries Navigator functions to manage and administer DB2 Universal Database (UDB) for iSeries. It serves as a companion guide for the database administrator to use DB2 UDB for iSeries. This book includes the latest announced features in V5R3 that iSeries Navigator provides for the database administrator of DB2 UDB for iSeries. This book includes the new graphical interface provided for database in V5R3. In addition, it covers the following topics.